We’ve seen this movie far too many times this season. No wonder some people are walking out of the theater in search of new entertainment. It was another “fill in the blanks” day at the KeyBank Center. The Sabres did little at the start of the game, fell behind, put on a late rally to make the game a bit interesting, but still fell short of a victory. 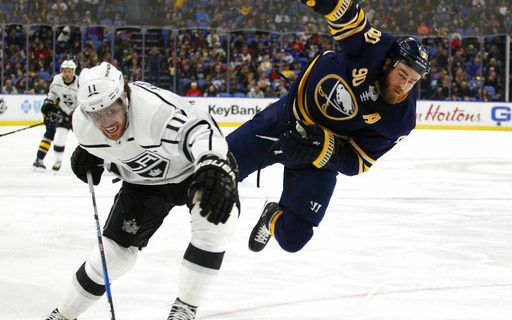 It happened again on Saturday, as the Sabres dropped a 4-2 decision to the Los Angeles Kings before 18,632. It was Buffalo’s second straight loss after a brief revival (two wins in three games). “I’m really disappointed,” coach Phil Housley said after the game. “I thought we were making strides. It became rather obvious rather quickly that the Kings were going to be given every chance to take home two points from their visit to Western New York. The Sabres looked sluggish and flat right from the beginning. The Kings were allowed to come out of their zone almost without much effort for the first 20 minutes, as the Sabres offered little resistance. That led to plenty of quality time in the Buffalo zone, which led to plenty of shots. Goalie Robin Lehner blocked almost all of them, but one from Michael Amadio dribbled through the netminder’s pads for a soft goal. “I stopped 18 shots (in the period), but allowed a brutal goal,” Lehner said. The veteran kept the Sabres in the job through the middle of the second period, stopping 26 of the first 27 shots he saw. But he was still behind by 1-0. The general rule is that if you throw enough rubber on goal, you eventually will be rewarded by the Hockey Gods. Those rewards came in a five and a-half minute span late in the second period, when the Kings boosted the lead from 1-0 to 4-0. Lehner gave up three goals on three shots during that stretch, but the team in front of him deserved more of the blame. Housley mercifully sent in Chad Johnson for the third period. Buffalo came out for the third period with a little zip. Marco Scandella scored on a blast in the first minute, earning one fan in the building a $5,000 check as part of a promotion. Scandella did a good-sized jump into the glass after scoring. “I was trying to give us some life, a spark,” Scandella said. But the second goal of the period didn’t come until only 3:18 was left to play when Rasmus Ristolainen tapped one home from close range after some nifty interior passing. The Kings held on from there. Buffalo had 18 shots in the period to go along with the two goals. So what. You don’t win games playing 20 minutes. Perhaps a few of the Sabres will be headed elsewhere by the time the trading deadline arrives in a little more than a week. But that shouldn’t be an excuse for not giving an honest day’s work. The Sabres will host the Washington Capitals on Monday afternoon.